On December 8, 2001, Sri Lanka ensured that Zimbabwe became the new holders of the most dubious ODI team record – that of the lowest total ever. In the opening match of a tri-nation series (also involving the West Indies) at the Sinhalese Sports Club in Colombo, left-arm seamer Chaminda Vaas returned a scarcely believable analysis of 8-3-19-8, as Zimbabwe were shot out for a paltry 38 in just 15.4 overs. Vaas’s figures are the best ever in ODI cricket, and the only 8-wicket haul till date. He actually had a chance of taking all 10 wickets, as he had 2 overs left when fellow ace bowler Muttiah Muralitharan scooped up the last two wickets within his first four balls. Zimbabwe’s total was the lowest in ODI cricket and their innings was also the shortest completed (the latter record is now held by Namibia, who were all out for 45 in 14 overs against Australia at Potchefstroom in 2002-03), both beating Pakistan’s 43 against the West Indies at Cape Town in 1992-93. To add insult to injury, Sri Lanka took only 4.2 overs to ease past the target and win by 9 wickets. However in the 2003 World Cup, Zimbabwe, a Test nation, were relieved of the ignominy of being the holder of the lowest total record as it was passed on to Associate nation Canada. 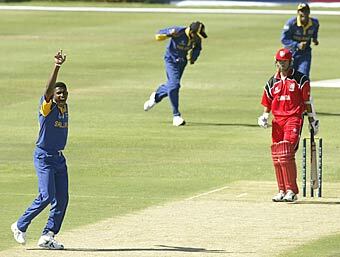 The opponents were Sri Lanka again, the match being a Group B league match at Paarl on 19th February 2003. In what was undoubtedly the most one-sided of World Cup matches, Sri Lanka whittled out Canada for 36 in 18.4 overs. At one point the score read 12/6, and not a single batsman reached double figures, the highest score being 9. Almost similarly to the match against Zimbabwe, Sri Lanka won by 9 wickets, scoring the required runs in 4.4 overs. Interestingly, the only wicket Canada managed (that of Sanath Jayasuriya) was taken by the Sri Lanka-born right-arm pace bowler Sanjayan Thuraisingam. In that 2003 World Cup, Zimbabwe had exceeded expectations and stood 6th out of 14 teams, although admittedly they were aided by England’s refusal to play them, with Zimbabwe ultimately scooping 2 points by way of forfeiture. The reason for this controversy was Zimbabwe’s political instability which had spread to its cricket system. Andy Flower and Henry Olonga began the uprising by protesting against the ‘death of democracy in Zimbabwe’, and just over a year later, Zimbabwe were reduced to a club-level team, devoid of the cream of their players, who after being fed up of the bias and politics, decided to quit international cricket for good. Zimbabwe’s first assignment as the new-look, utterly amateurish team was a 5-match home ODI series against Sri Lanka in April 2004, under the captaincy of the spunky wicketkeeper Tatenda Taibu, who at just 20 years and 342 days, became the youngest ever ODI skipper (Later that year, Bangladesh’s Rajin Saleh broke that record, when he led against South Africa at Edgbaston, aged 20 years and 297 days). In the first game of that ODI series, Zimbabwe actually impressed as Sri Lanka won by only 12 runs on the D/L method (Taibu led from the front with 96). But as the series wore on, Zimbabwe were thoroughly outplayed by their accomplished opponents, expectantly losing the series 5-o. Their lowest point came in the 3rd game, played at the Harare Sports Club. The record which Canada usurped a year ago was back with Zimbabwe, and yet again Sri Lanka were the ones who did the damage. No player scored more than 7 as Zimbabwe tumbled for 35 in 18.4 overs, worsening Canada’s feat by one run. It was not looking this bad at 18/1 in the 8th over, but the next 7 balls saw 4 wickets fall, and the hosts simply were struck by disaster thereafter. Vaas was at the forefront here too, taking 4/11 (reaching 300 ODI wickets on the way) while fellow fast-medium bowler Farveez Maharoof returned a neat 3/3. Remarkably, this too was a 9-wicket win for Sri Lanka, as they reached 40/1 in 9.2 overs with opener Saman Jayantha dispatching Tinashe Panyangara into the stands to complete Zimbabwe’s embarrassment. Thus, in just a span of less than two and a half years, Zimbabwe lost and regained the most unwanted ODI team record. While it might be a bit difficult for any team (Sri Lanka again maybe?) to bowl out their opponents for less than 35, the Sri Lankans themselves came perilously close to break the record, when in pursuit of 301, they were reduced to a shocking 13/6 and then 24/7 by South Africa under lights at Paarl in 2011-12, before eventually settling for a total of 43, joint fourth-lowest along-with Pakistan’s 1992-93 showing. This is however, the lowest total while batting second. Incidentally, while Zimbabwe regained the record within a short time, Canada took 24 years to regain it when they were shot out for 36 in the game mentioned above – their earlier record of 45 (in 40.1 overs!) against England at Old Trafford in the 1979 World Cup remained for as long as almost 14 years until Pakistan snatched it in 1992-93.